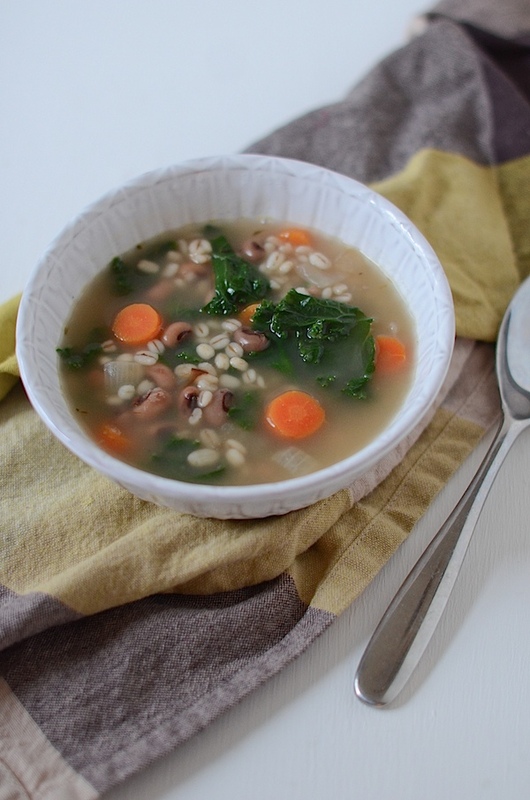 Go ahead and book this one for your post-Easter meal – a Vegetarian Barley Blacked Eyed Pea Soup recipe. After indulging in the traditions – ham, mac and cheese, mashed potatoes, and what not – you’re going to want something a little on the lighter side afterwards. But this Vegetarian Barley Black Eyed Pea Soup recipe isn’t just great for a post-feast recovery meal. 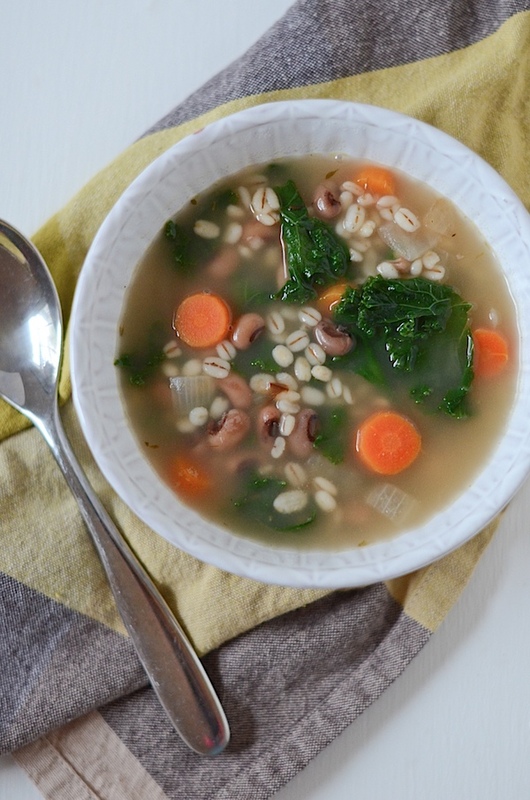 This soup recipe also makes for a delicious New Year’s Day meal with the traditional lucky black eyed peas in the mix. You can also use it for a light entrée any time. In fact, I made a big batch of this one Sunday and saved off individual servings to store in the freezer for later. I’ve had them after post-work workouts and just-plain lazy days, and they’ve been a relief to have on hand. Served with saltines or (my preference) toasted whole grain bread with a light smear of butter, this is easy eats perfection. If you’ve been reading The Chic Life for long, you know I’m a big fan of homemade soup. There aren’t many things I think re-heat better, and I’m so over canned soup. I haven’t had any in years since the canned versions usually have so many extra, unnecessary ingredients and entirely too much salt. With each passing year, I’m turning more and more into that stubborn old woman who knows exactly what she wants and demands nothing less, and I’m okay with that. 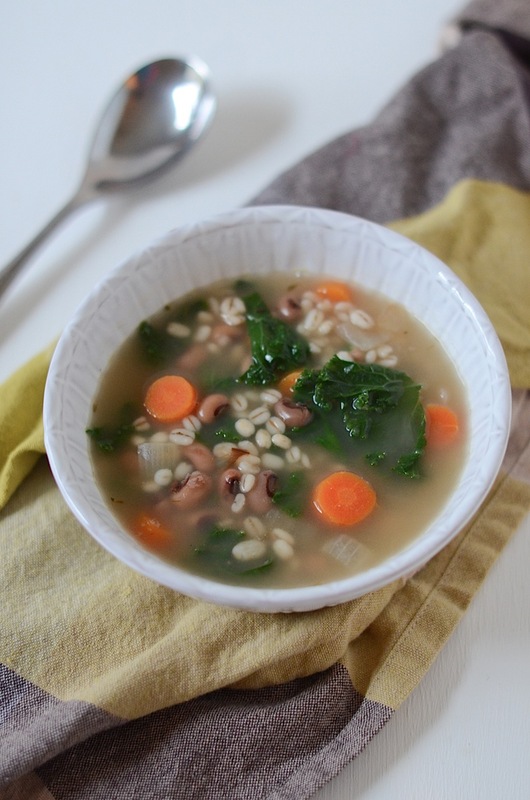 Did I mention there’s kale in this Vegetarian Barley Black Eyed Pea Soup recipe? Yep. As you know, I’m a fan of this dark green superfood. And hey, it’s one of the most hipster foods, apparently. Guess I’d better stock up on craft beer and PBR to make this a complete meal. 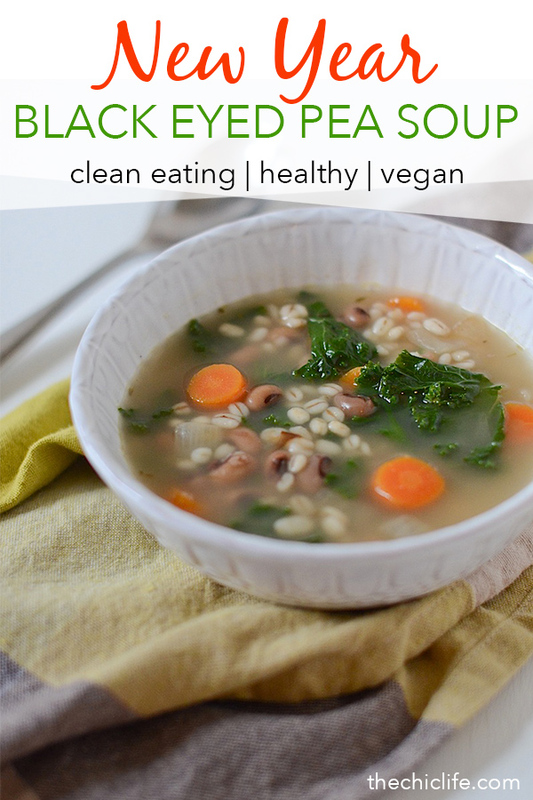 Vegetarian Barley Black Eyed Pea Soup Recipe makes for a great, light meal for lunch or dinner or even a nice, cozy snack. Enjoy with toasted whole grain bread or saltines. Pre-heat oil in a large pot over medium heat. Add onions and carrots and cook until onions are translucent, about 5-6 minutes. Add broth, black eyed peas, barley, sage, rosemary, thyme, salt, and pepper. Bring to a boil, reduce heat to simmer and cook until barley is done, 12-15 minutes (or until cooked according to package directions if you’re using another type of barley). Add more water if you want the soup more brothy. If using, spray in Bragg’s Amino Acids. Taste test and season with additional salt and/or pepper (or Bragg’s), as needed. Serve. Garnish with fresh parsley, if using, and enjoy. Note: I used 10 minute barley from Trader Joe’s, which I recently discovered. This saves a lot of cooking time since most barley cooks for more like 45-50 minutes, but you can use any type of barley you wish. 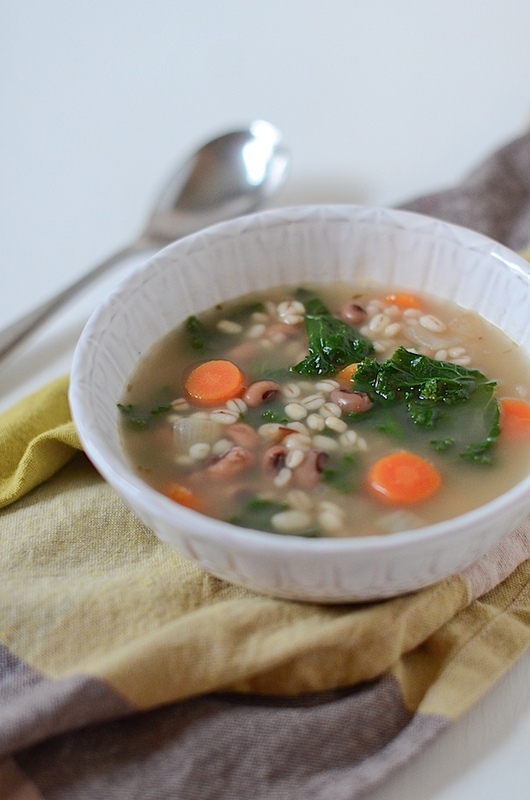 Just be sure to cook the soup long enough so the barley is the texture you want. Note: If you store the leftovers for later, you may notice the barley soaks up more of the liquid. When you go to re-heat it, you may wish to add some more broth or water to make it more liquidy. 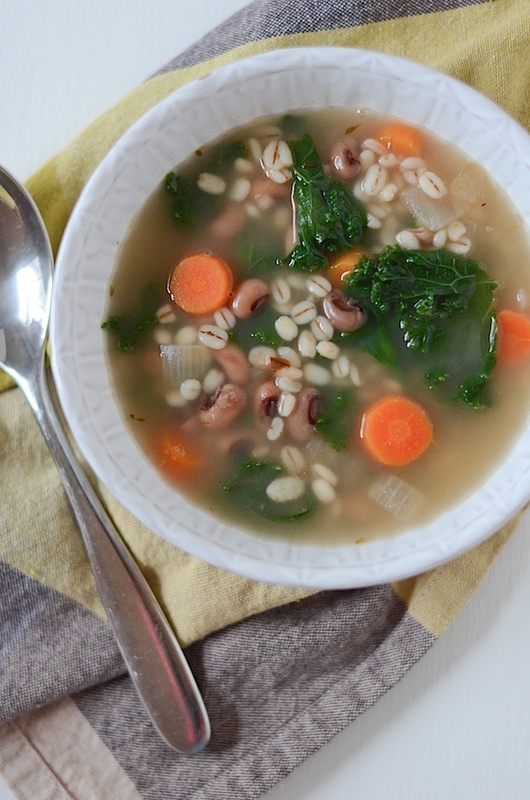 Ingredient Note: I really like the canned black eyed peas from Eden Organic. Not only are the beans organic, the can is BPA free. The ingredients are simply organic black eyed peas, water, and kombu seaweed. Eden Organic uses the kombu instead of salt when cooking their beans since it offers many benefits, including adding flavor and working as a tenderizer for dried beans. Made this for the Pinterest!